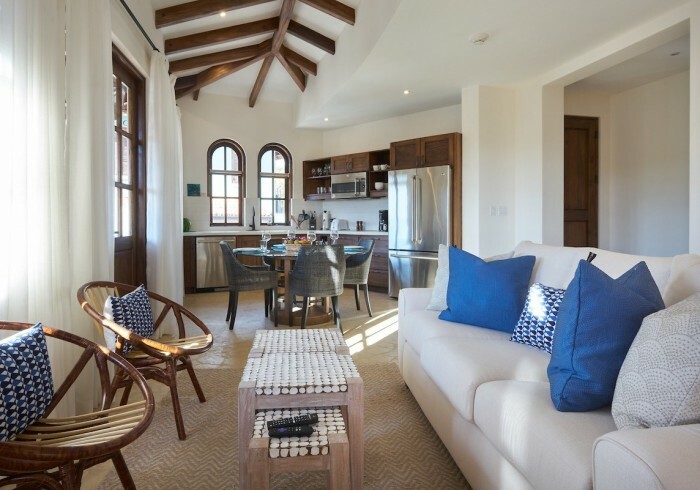 If there is any flat in Las Catalinas that particularly echoes the refined beauty of its façade, it may be this spacious vacation rental in Plaza Carlota, featuring a large balcony with a terrace overlooking the plaza and town below. Inside this cozy Costa Rican beach apartment, white and cream-colored walls contrast with dark wooden doors, windows, and furnishings, while turquoise and blue notes spread around are a lovely reminder that the sea calls from nearby. This Guanacaste beach rental features an airy great room with slightly curved, undulating walls that recall the gentle waves of the Pacific Ocean. The fully-equipped open kitchen gives way to two different sitting areas, perfect to entertain family and friends or unwind after a day at the sea. A semi-circular alcove off the living room can help accommodate overflow sleeping. If the playful swing sofa in its charming pergola-covered garden terrace offers you an open look at the lovely beach apartments and villas below, the simple elegance and comfort of its master bedroom make it a haven of calm and privacy. Featuring a king bed and an en-suite bathroom, it allows for the kind of leisure and repose essential to any Costa Rican vacation. At the entrance of Beach Town, Las Catalinas, yet just a couple of minutes from the beach, this enchanting Guanacaste beach apartment gives off an authentic, traditional sea town feel. Up to four guests can be accommodated at this Carlota apartment, where children are welcome. Embrace the comfort of a private beach apartment in a picturesque setting, enjoying the wonders of Costa Rica the way it’s meant to be. Enjoy the privacy and quiet of your own apartment with full daily housekeeping service and let our dedicated concierge team help plan your dream vacation, today.